If you’ve ever gone skinny-dipping and had the creepy feeling you were being watched, you were right. The green slime floating on the surface of the water and coating the rocks was watching you. And it was doing it using eyes similar to your own human ones. That’s according to new findings by a team of scientists from Britain and Germany, which is published in eLife. The team was studying the bacteria Synechocystis. It’s not an accomplished aquatic bacterium, since it can’t swim, but it does have tiny hair-like cilia that allow it to crawl its way across wet surfaces like rocks. Synechocystis uses photosynthesis to make energy for itself, and so it’s dependent on the sun. Researchers have long known that Synechocystis can sense light and will haul itself towards a light source. But exactly how it perceives that light was unknown. Scientists surmised that Synechocystis might have tiny receptors along the outside wall of its cells that measure different light levels on either side of its body, or may have some system that measures the chemical reactions of its environment to light. Or, according to this new study, it could see the world just like us. When the research team put the bacteria on a surface that had a gradient of light —a slow increase of intensity from dark to light—the bacteria moved randomly. E. coli bacteria, on the other hand, have sensors that respond to chemical stimulus, and thus would have sensed the gradient and accumulated in the area most comfortable for them. Give the Synechocystis one light source, though, and they’ll move right towards it. 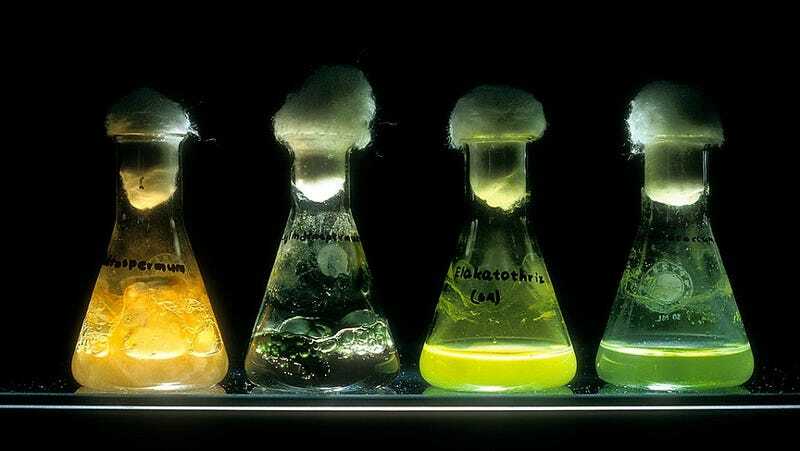 To confirm their suspicions, the scientists made a mutant Synechocystis bacteria that produced green fluorescent protein. The protein would show up whenever light excited the periphery of a cell. In response to a laser aimed at one part of the cell, the green fluorescent protein lit up a spot on the opposite side of the cell, the way shining a light on the lower left region of a human eye would cause the upper right part of the retina to react. “The cells act as tiny spherical lenses,” the researchers wrote in their study. Light that shines in the front is focused on the back cell wall. On the back wall, “light-detecting molecules called photoreceptors,” respond to the light, letting the bacteria get a blurry and basic picture of the world. That’s exactly how the human eye works. So the bacteria don’t just have eyeballs, they are eyeballs. They’re crawling, and sometimes swimming, eyeballs that live in the water with you. And you thought sharks were creepy.